Food plays a large part in defining our experiences, especially in Samoa. If the food was good, everything else that wasn’t was overlooked. But if the food wasn’t up to par, nothing else was too. In the case of airline food, it is usually not synonymous with adjectives like “tasty” or “delicious”. Normally they’re just...well...airline food. Not so with Samoa Airways. The airline has brought on board Aggie Grey’s In-flight Catering to supply meals for all of its flights. As a result, the food on board is a unique combination of local flavours that also appeal to international taste buds. “We strive to infuse a lot of local ingredients into our meals. We use luau, eggplants, bok choy, local meats, locally produced cold cuts, eggs, fruits and herbs,” said Tanya Grey Jnr of Aggie Grey’s In-flight Catering. 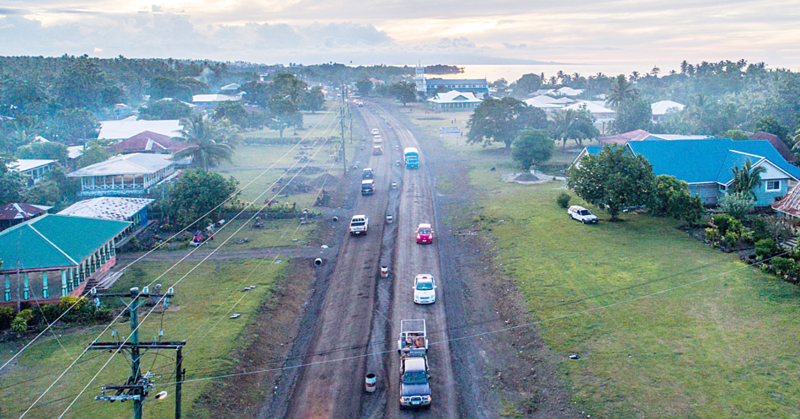 This partnership between Samoa Airways and Aggie’s has worked well for both parties, the national airline partners with a local company that in turn partners with local villages and farmers in sourcing its produce. “We try to do Samoan twists on a few of our dishes. Our vegetarian option for Economy is a luau (green taro leaves) and eggplant lasagna,” said Grey Jnr. This collaboration dates back to the Polynesian Airlines era when Aggie Grey’s Catering was also supplying all the in-flight meals, which makes Aggie’s a seasoned player in this field. 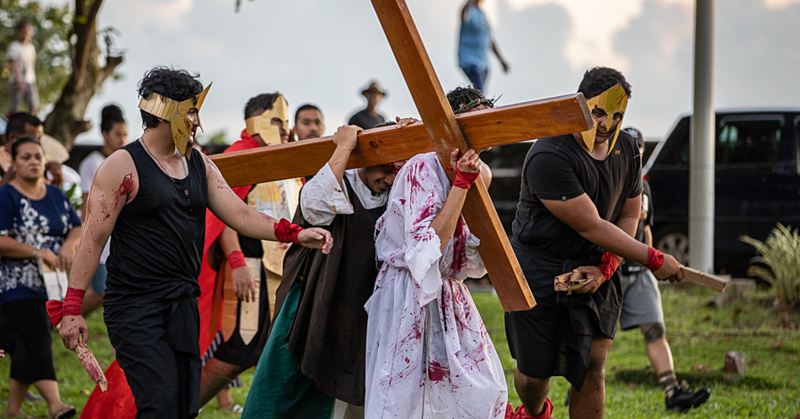 “When we were approached again by Samoa Airways this time around to be their supplier, my father heard about it and he just said, ‘Go and do it and do it well’. And that’s what we’ve been doing ever since,” said Tanya Grey Snr of Aggie Grey’s Catering referring to the late La’auli Alan Grey. It’s a partnership that Samoa Airways’ C.E.O., Tupuivao Seiuli Alvin Tuala said the airline values a lot. 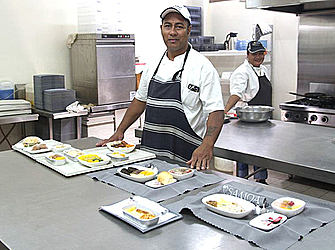 “We’re proud to be able to reconnect and partner with the highly experienced Aggie Grey’s In-flight Catering team in the provision of high quality, wholesome meals which have been prepared and infused with Samoan ingredients and flavours for the enjoyment of our customers on our flights out of Faleolo,” said Tupuivao. Aggie’s uses local meats, vegetables and fruits. “Most of the ingredients used in those in-flight meals are sourced from the big island of Savai’i. This has been particularly the case after Cyclone Gita earlier this year in February which destroyed many fruit trees and vegetable gardens,” said Grey Snr. The catering staff is all local, including a chef who has worked in this capacity with the company for more than a decade. 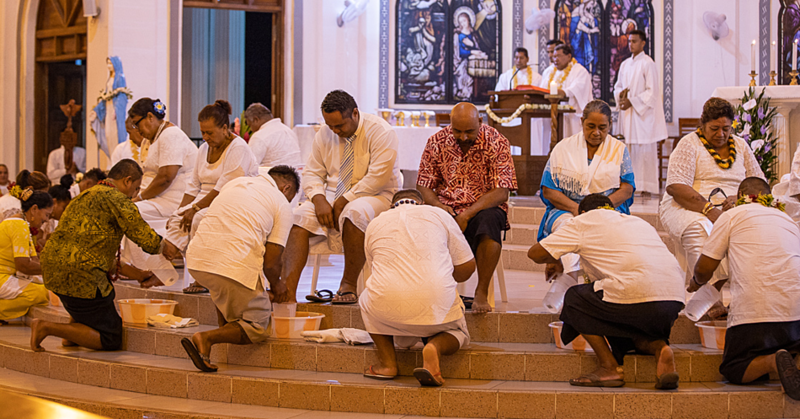 Sialaoa Mailata has been doing this job for as long as he can remember and he hopes to continue doing this for as long as he can. “I’ve been doing Airline catering for over 15 years, all of which I have been working at Aggie’s Catering. I have been overseas and worked in hotels, but its airline catering I prefer. It’s the system that I really like. Everything has a set routine and set of procedures. It’s what I enjoy, what I have been trained to do and I love putting my skills to good use in my work,” said Mailata. As it is currently the peak tourist season, flights are regularly full now. This means that Aggie Grey’s Catering produces up to 170 meals per flight, which they do with much creativity and flair. “We love to have a good twist on the dishes. Plane food is perceived to be very, well, plain. Samoans love their local flavours. So we try and use a lot of coconut cream and luau at the moment, as well as local fruits for our relish to keep things exciting,” said Grey Jnr. In-flight catering is a delicate industry to be involved in as there are certain regulations and strict rules that any in-flight catering company has to adhere to. And it’s something that Aggie’s In-Flight Catering is well aware of and well prepared for. “The preparation of wholesome food for airline passengers is a complex process involving the coordination of many different foods and service providers locally and internationally,” said Grey Jnr. “For us at Aggie Grey’s Catering, food safety is of paramount importance and requires strict adherence to established procedures and careful monitoring to ensure the expectations of airline customers are met”. There are also international guidelines that need to be satisfied. “It is a high standard of hygiene from source to storage of fresh foods, dry goods, frozen foods and even packaging of utensils etc, to the safe processing and preparation of meals, and finally to delivering the final product. It is more of a preventative standard,” said Grey Jnr. If feedback by the airline’s passengers is anything to go by in terms of how much they enjoy the food on board, it seems that this partnership between Samoa Airways and Aggie’s looks set to continue to give travellers a unique taste of Samoa in the sky.